You read it here first! We are handing out rolling high-fives to any and all cyclists that cruise by one of our cheering stations on the annually celebrated Cascade Bicycle Club’s F5 Bike to Work Day happening this Friday. We are excited to see every make and model of bikes from recumbent to tandems and everything in-between – we know you unicycles are out there somewhere! If you’re shaking your head because your bike is still tucked away in the garage, it’s officially time to come out of hiding as thousands of folks from all over the county will make their way into work on two wheels and you just don’t want to miss this kind of fanfare. A cloudy forecast and a small chance of rain doesn’t hurt, either, for all you fair weather riders. 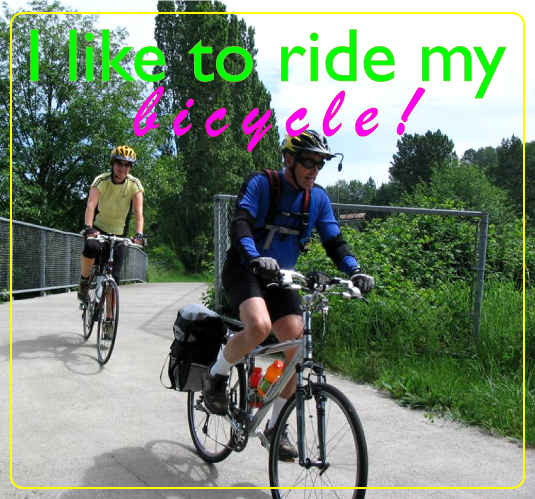 You’ll also find a couple more stops hosted on King County Parks’ Sammamish River Trail. We’ll be passing out King County Parks Regional Trails maps, goodies and you might just have a chance to win a really cool prize; the kind of prize worth bragging to your friends about. The King County Regional Trail System is one of the nation’s most extensive multi-use off-road systems with over 175 miles of trails for bicycling, hiking, walking, and horseback riding. The RTS spans an area from Bothell to Auburn and Seattle to the Cascades. Next Post Oh, this is different. Have you ever been “green birding”?